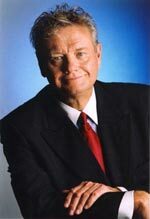 Woody Paige, a native of Memphis, began is career as a sports columnist in with The Whitehaven Press in 1963 after graduating from the University of Tennessee. He later went on to cover politics for The Knoxville Journal and civil rights for The Memphis Commercial Appeal and The Rocky Mountain News. Paige joined The Denver Post in 1981. A recipient of more than one-hundred local, state and national media awards for column writing and sports stories, Paige is a member of the Pro Football Hall of Fame Selection Committee and is a Baseball Hall of Fame and ESPY Award voter. Paige is a regular contributor to ESPN Classic's Emmy Award winning SportsCentury series, and his work has also appeared in The Sporting News, Sports Illustrated, Newsweek, Time and Street and Smith. He is also the author of seven sports books. He is involved in more than twenty-four charitable events annually and currently serves as Chairman of Fund-A-Cure of the Children's Diabetes Research Foundation.